We have a wide range of products that will bring light into your life and help you overcome Seasonal Affective Disorder (SAD), and other problems arising from a lack of light. Let us help you with light therapy, the best medical treatment. Our growth has been due to our uncompromising customer service, and exceptional product quality. 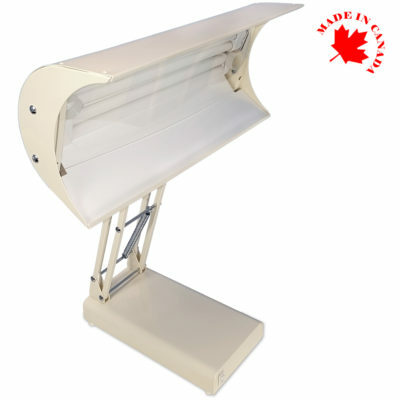 All our bright light units are manufactured in Canada. We have a wide range of products that will bring light into your life and help you overcome Seasonal Affective Disorder (SAD), and other problems arising from a lack of light. Thousands of clinicians across North America, Europe and Asia recommend our units. We have participated in the annual meeting of American Psychiatric Association, the American Psychological Association, and the SLTBR (Society for Light Treatment and Biological Rhythms) conferences for the past 20 years. We use the latest findings to ensure that our products meet the necessary criteria. If you experience lower energy levels, sleep disorders, reduced libido, fatigue or irritability as fall and winter approach, you may be suffering from the Winter Blues or the much more severe Seasonal Affective Disorder (SAD) or other circadian rhythm disorders. Let us help you with light therapy, the best medical treatment. It’s an excellent high quality product. 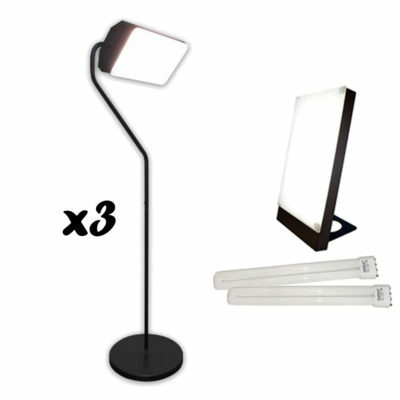 I purchased this Travelite lamp in 2011 because it is not bulky and light weight. I’ve been using it pretty regularly every fall to spring since then. Only in 2019 the light finally burnt down and I just ordered a replacement. Great high quality products! This has saved me from the misery and depression that used to happen every September to January. I use it at least 3 times a week and it staves of the grouchies. My kid are grateful too. :). Battery lasts for several treatments. Easy to wear. I wasn’t able to sit still in front of a lamp for 20 mins, and this gives me the freedom to move around. I love this clock. Have had it over 5 years now, light is still bright and oh so helpful in the morning. I really like the sundown feature as well. The only critique I have is that it loses time. Every few days, I need to readjust the time as it is running slow. Hoping I get a lot more life out of my bulb. THANK YOU Lumie for creating this product and to NLT for distributing it in Canada. This product is really good. I’ve had my lamp for a decade and have yet to need to even replace the bulb. It’s been moved repeatedly with no issues. I use it as a studio lamp (I am an artist) and it’s in use for hours each day. Certainly worth what I paid for it. 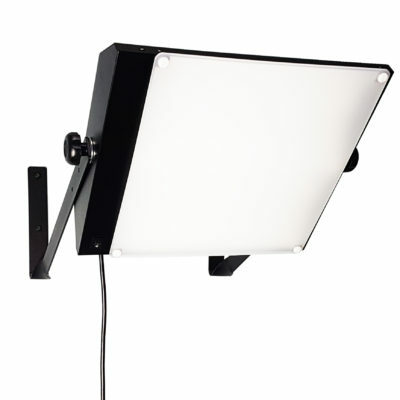 I am now considering purchasing the ceiling light, as I am moving to a studio with only one small window. I’m confident it will be a quality product as well. We have a bigger lamp at home that we all share, but I bought this for my daughter when she went to college. She thought it was great for her dorm room desk. Amazing! I would highly recommend this clock, I feel more awake and energetic. I found it not to be user friendly when setting up and I dislike the 24hour clock. Overall it’s worth it every penny. Although the product is good, the battery tends to die early. This lamp has made all the difference for me! I used to be incredible low energy during the winter time, which lasts a while here in Calgary, Alberta. I use this in the morning and it gives me that boost of energy throughout the day. Well hard to believe… This works. Tried everything, you name it. I am using it at least for 3~4 hrs a day for the last 2 months and I feel more energetic and still not feeling depressed. The cold/flu like symptoms are gone and I am hoping they will stay that way. I’ve had this lamp since I moved to Canada over 13 years ago. I can say with no doubt that it has made my life easier during the fall/winter months. The size is perfect for me and the quality is amazing. I have had my SADELITE for just over a year and I could feel the change in my mood within a matter of a few days. It is the best thing I ever got to help me cope in life. We purchased the Luxor Desk Lamp about a year ago and are very pleased with it. Within a week we began to feel brighter and more energetic despite the dark dreary days of winter. 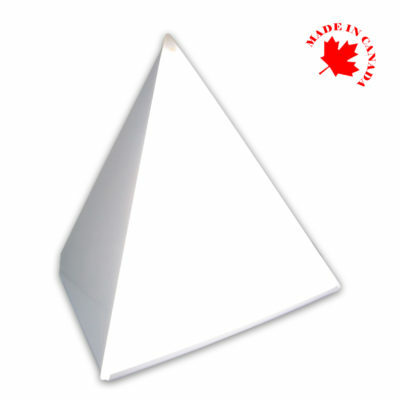 The light is bright and clean and the pyramid shape makes it a rather “cool” feature on the desk. On the downside it’s not very portable, however, since it’s not meant to be a “travel” light that seems to be a mute point. Love the light. The service was excellent. I’ve owned one of these ugly but sturdy and reliable lamps for 13 years, and have used it daily from November through May, with great results. I’ve never had to replace a bulb. I bought a second one for the office 4 years ago, and couldn’t be more satisfied with a product. Have recommended it to friends and colleagues. Combined with a daily hour-long walk outside when the sun is at its highest, this lamp has been a very wise investment. I bought this light the second Northern Light Technologies stocked it (maybe 3 years ago?) and I LOVE it. My last apartment had black out curtains so it was really helpful to have Lumie to wake me up. I also really like the sunset feature. There are a few annoying aspects (such as the method for updating the alarm setting) but they are vastly overshadowed by how wonderful the light is. I recommend Lumie to all of my friends. One of my favorite purchases of the last 5 years. It’s that good. Bought my light in 2003 and ordered extra bulbs. My light experienced heavy use, in addition to using it up close for SAD, I also used it as a light in my dimly lit office at work. It has run an average of 8 hours a day for 5 days a week for the last 9 years. It finally gave out in the last week. I never used the extra bulbs I ordered. I have ordered a replacement and of course it is from Northern Light Technologies. I am so happy that you sell replacement bulbs. We recieved this package really fast and it was easy to replace the bulb. These bulbs last a really long time and we use all of our Northern Light lamps every day. This is a must buy! I recommend it to anyone looking to wake up feel awesome! Wonderful! I use this when we are doing projects outside in my work shop which does not put out a lot of light. I love how portable this is and how I can take it with me on trips as well. High quality and easy to use. I have this unit at my job and it makes my life so much easier. I love it! Use this everyday and still works the way it should. I did a lot of research before buying this model and I felt this was the best choice for me. My doctor suggested this unit and I would recommend to anyone that sits at a desk. I really love this lamp. It works great and I have had no problems with it. This is a great unit. I highly recommend it. Sits right at my desk during the morning. the sound effects and radio are nice aditions to this body clock. it has helped me with the sleeping and waking. very Pleased! I love this desk lamp. Works great and really makes me feel better! A must have for the rainy season.